Our elegant solid ash shelving is a sophisticated addition for the home or office, and is well-suited to our solid wood kitchens. This impressive ash floating shelf is 1500mm long, providing ample storage space, and comes with the specialist fixings for creating a distinguished floating effect. This elegant ash shelf has been created by our skilled team of timber specialists, who combine a robust knowledge of wood with the latest innovations in wood-cutting technology to produce shelves with great precision and care. Once the shelves are cut to size, they are sanded to 150 grit smoothness and coated in protective wood oil for a consistent and attractive finish. Our floating solid ash shelf measures 1500mm X 300mm X 40mm and is provided with a contemporary square edge profile. Made using the same methods as our solid ash worktops, each shelf is made from a number of 40mm-wide wood staves, which are finger-jointed and meticulously glued together under high pressure. 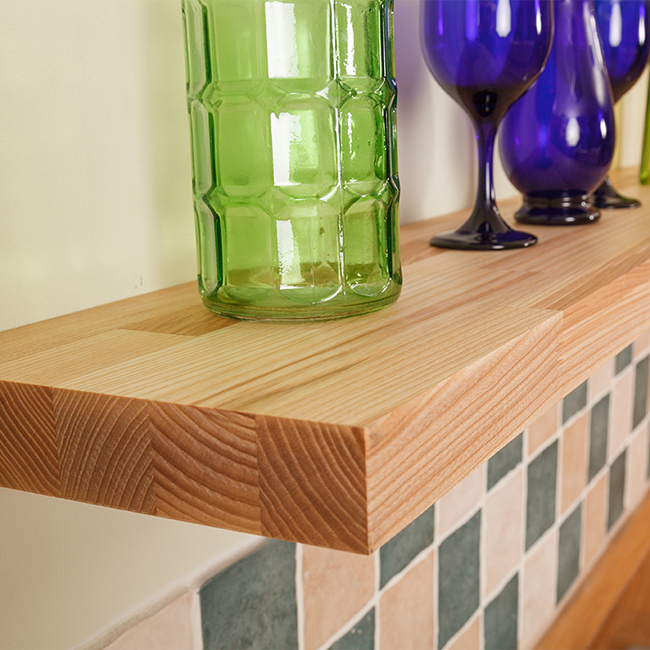 This extra-long ash floating shelf comes with four specialist brackets, and is pre-drilled for your convenience. These shelves are best installed against a solid brick or concrete wall. If you would like to fit the supports to a partition wall, we advise them directly into the timber studs for maximum stability. Wood shelves can showcase an array of beautiful and unique markings within the natural grain pattern. Occasionally, small knots and splits can occur; though rare, these are simply further natural developments that enhance the unsurpassable beauty of real wood.